Peter Kimani launched his novel Dance of the Jakaranda at the Goethe-Institut Nairobi on September 28, 2018. The Kenyan author had Wamuyu Maina as discussant and James Murua as the Moderator. Dance of the Jakaranda by Peter Kimani is a novel that follows characters in the 1890s during the building of the Lunatic Express that was the Kenya-Uganda Railway and 1960s independence times. It has been making waves wherever it has been seen for both its content and its style. Its US edition was listed as one of the year’s notable books by the New York Times and shortlisted for the Hurston/Wright Foundation Legacy Awards. The book hasn’t yet gotten a Kenyan publisher but this hasn’t prevented audiences getting to engage with the book and the author. The first of these occasions was at the Aga Khan University’s Graduate School of Media and Communications last April when everyone got to have a sneak peak at this new title. This would be followed earlier this year when This Bookish People hosted the author to a reading at the National Theatre in June. 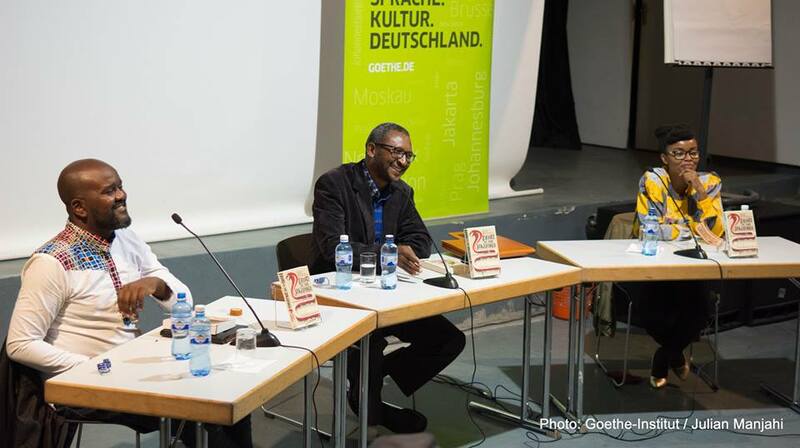 The Goethe-Institut in Nairobi was the latest venue to enjoy the authors company and craft as the auditorium filled to listen to the author. On the panel with Kimani was Wamuyu Maina an academic who moderated the author at the previous event in June; she would take the role of the reader of the book. The event was moderated by book blogger James Murua. The questions would come fast and thick from the panel as well as the audience that included John Sibi-Okumu who read the audio book of the title, Kinyanjui Kombani still glowing from his Burt Award win, Awaaz’s Zahid Rajan, author and historian Zarina Patel and many others. Some of the questions were on why he picked an Indian character as a protagonist, whether he was thinking about the Chinese Railway we are currently being eaten alive by when he was writing the book, and the reason why he still doesn’t have a Kenyan publisher. After the robust discussions, the audience bought books supplied by Prestige Books and got them autographed by the author. Here are sights from the event. All photos are courtesy of Julian Manjahi/the Goethe Institut. Previous Previous post: Lagos International Poetry Festival 2018 at end of October.